Bhagavadgita means the song of God. It is a conversation between Lord Krishna and Arjuna in the middle of the battlefield on various aspects of life, duty, knowledge, discretion, yoga, sameness, equanimity, asceticism, renunciation, detachment, creation, manifestation, Supreme Self, individual Self, God, devotion, liberation and devotional service. Its message is lead a divine centered life, do your duty as an offering to God without seeking its fruit and work for your liberation with detachment, renunciation, knowledge, wisdom and devotion. The Bhagavadgita is a sacred book of the Hindus. It is read by people in many Hindu households regularly. The book is also the central theme of many teachings, study courses and discourses. 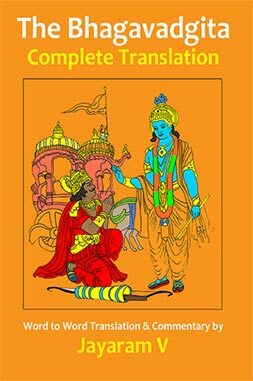 The book is meant for the Bhagavatas or the selfless servants of God. In the words of the author, "The Bhagavadgita portrays many core beliefs and practices of Hinduism in the form of a sacred dialogue between Lord Krishna, the Supreme Self and Arjuna, the individual Self. It reflects the ideal vision of God as the center and circumference of all life and creation. Revealed directly by God Himself, it is a compendium of ancient yoga philosophies on liberation, with universal appeal and ageless wisdom. It inspires those who want to live dutifully and attain freedom from the limitations of life. Composed originally in Sanskrit, it delivers a unique message, which is still relevant, exhorting the devotees of God to live virtuously and perform their duties selflessly as an offering to Him, with detachment and dispassion. It presents the spirit-centered life of pure beings, whose sole aim is to attain liberation in this life, contrasting it with the ego-centered life of the worldly people, whose sole purpose is to pursue their desires and raw passions for their enjoyment and self-preservation. Declared as the secret of the secrets, it reveals itself to the extent one probes into its depths and contemplates upon its verses. With each reading, your knowledge grows and you develop newer insights."